FlashPlug simply is plugged onto the handheld, offering additional 8 MegaBytes of nonvolatile secondary storage. 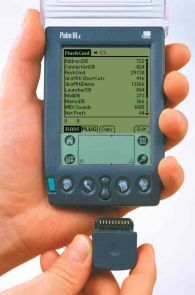 FlashPlug can be utilized similar to a floppy disk, a filemanager application that comes with FlashPlug is used to copy files between the handheld and FlashPlug. Instant mobile backup of all or parts of the data and programs in your handheld. Carrying eBooks and other electronic publications enriched with graphics that otherwise would consume too much RAM. Secure sensitive data in FlashPlug, e.g. handing over medical data. No tedious IR beaming, no LAN access, no wired or wireless access, no desktop station needed. FlashPlug simply fits on the port of the handheld. 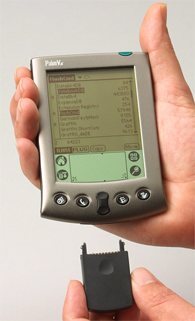 No screwdrivers needed and avoiding heavyweight add-ons that would void the portability of a shirt-pocket sized computer. Less than 10 g in weight, FlashPlug offers 8 MegaBytes flash memory and doesn't need extra batteries.